The Indian gooseberry, known locally as Amla, is a tree that is famous for its nutrient rich fruits. 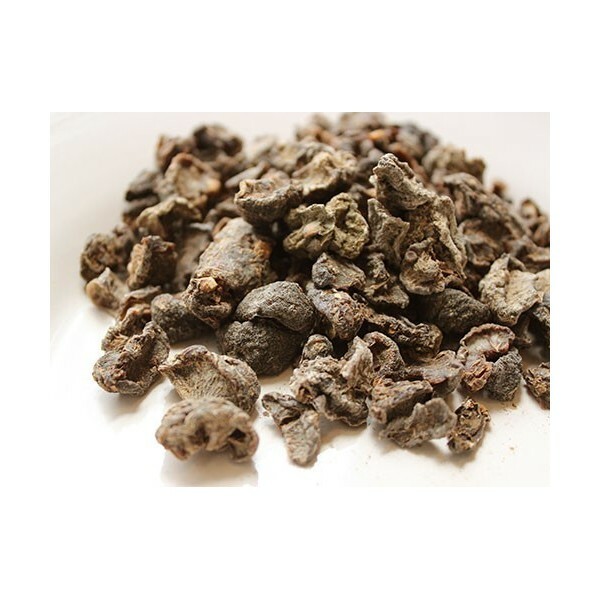 It has been a common ingredient in the ancient Indian medicinal practice of Ayurveda. It’s a potent source of Vitamin C and also contains iron and calcium. Because it is so versatile, it has become a favourite among the health conscious masses. Amla is virtually a superfruit. It is full of antioxidants that are effective in reducing cell damage (1). It reduces the effects of free radicals (which are responsible for damaging protein, DNA, and cell membranes) and thus effectively combats the aging process. If you’ve got a pesky sore throat problem, then Amla is the fruit for you. Amla juice mixed with a few pieces of chopped ginger and mixed with a tablespoon of honey has been proven to be an effective treatment for a cough and a sore throat. High cholesterol is the leading cause of heart disease. By reducing the build up of bad cholesterol, Amla reduces the risk of heart disease. It also reduces clogging in the arteries by boosting good cholesterol or HDL (2). Studies have also shown its benefits in preventing the thickening of blood vessel walls, the first sign of heart disease. Any fruit that is diuretic in nature improves the frequency and volume of urination (3). Because urination helps your body release unwanted toxins, salts, and uric acid, consumption of Amla has a detoxifying effect on your body. Because of its ability to increase the absorption of protein, Indian Gooseberries are a great way to boost your metabolic rate (4). Your metabolic rate is how fast your body burns calories. Boosting it will lead to faster weight loss, higher energy levels and an overall increase in lean muscle mass. Research has shown that fruits that are rich in polyphenol protect the body from the oxidative nature of high blood sugar. Amla can thus be therapeutic for people afflicted with diabetes. It also assists the body in the proper absorption of insulin, thus reducing blood sugar levels. Because of this, it is invaluable for people afflicted with diabetes and should be a part of their daily diet (5). Amla is high in fiber, water content, and has anti-inflammatory properties (6). Fiber is essential for healthy bowel movements. It is also necessary for the secretion of gastric and digestive juices. Thus, Amla is great for the entire digestive process. Amla is a rich source of antioxidants and vitamins, and contains tannins (7). Tannins, when combined with polyphenols, makes the fruit a free radical scavenger. What this means is, it reduces the damage free radicals cause to the cells and thus improves your body’s disease fighting ability. Extra cholesterol is the primary cause of gall bladder stones. Vitamin C converts the cholesterol into bile in the liver (8). Consuming Amla regularly reduces the chances of a build-up of cholesterol as well as the likelihood of any pesky gallstones. It also keeps the gallbladder functioning well and in perfect health. Due to its antibacterial properties, Amla is a great way of preventing ulcers (9). 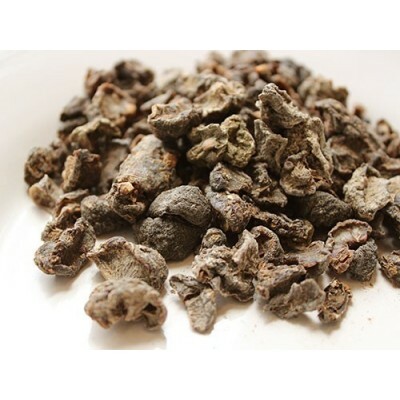 They reduce the acidity level in the body and thus avoid the formation of ulcers. Additionally, mouth ulcers can be caused by a deficiency of vitamin C. As Indian gooseberries are rich in vitamin C, they can provide relief from ulcers. It reduces the level of acid in the stomach and combats stomach inflammation. It also keeps the liver in check and flushes out unhealthy toxins. If made a regular part of the diet, Amla has been known to improve eyesight (10). It also helps in curing itchy, watery, and sore eyes. Because it is packed with antioxidants, Amla works as a blood purifier. It also increases haemoglobin and red blood cells count. Amla is excellent for strengthening bones not just because of its high calcium content, but also for the fact that it lowers osteoclasts (11). These are the cells responsible for breaking up bones. Thus regularly consuming Amla will result in stronger bones. Amla has three times the vitamin C of an orange. Vitamin C improves tannin levels in the body that shield from heat and light. It keeps your skin cool in the summer by regulating the heat. 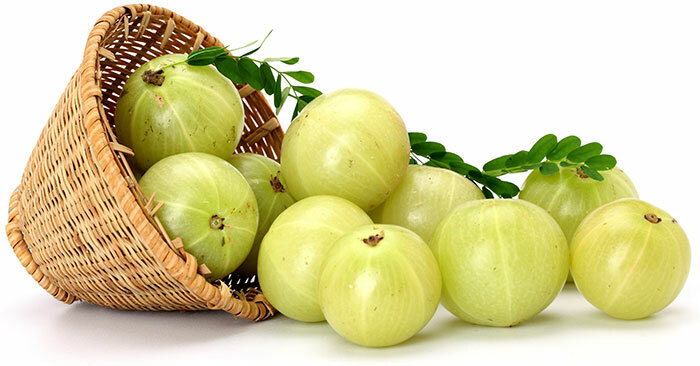 Because of its high fiber content, Amla is great for the digestive system. A happy side-effect of this is its effectiveness against constipation. Because of its antibacterial nature, Amla prevents infections like jaundice and scurvy (12). Consuming Amla on a daily basis in the liquid form is the most efficient way to fight off these infections. Because Amla is rich in antioxidants, it has various medical applications. Superoxide dismutase, which fights free radicals and reduces cell damage, acts as a potent tool in the prevention of cancer (13). 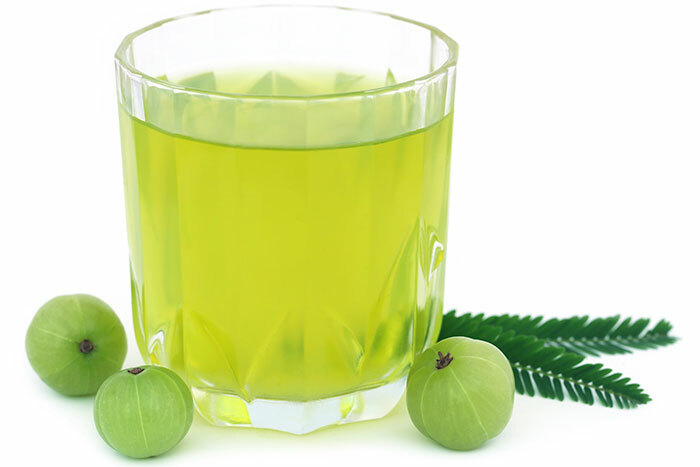 Studies have shown that regular consumption of Amla can ward off the ill effects that alcohol has on your liver (14). It also prevents the oxidative damage that is usually caused by them. Because it’s packed with vitamin C, Amla gives your skin a smooth and youthful look (15). It is known to exfoliate skin and remove dead skin cells. Amla juice can also be used as a face mask. Simply leave it on your skin for 30 minutes and wash it off. Amla is effective for lightening the skin because of Vitamin C (16). Chop up a few pieces of Amla and blend it till it forms a smooth paste. Mash a few pieces of papaya in a bowl. Add half a teaspoon of Amla paste and half a teaspoon of honey to it. Mix well till the paste is smooth. Apply and leave it on for 15 minutes. Rinse it off with warm water. Add one teaspoon of tamarind paste to one teaspoon of Amla powder and mix well. Apply to the face with your fingertips. Gently massage into the skin in a circular motion. Rinse with warm water after 10 minutes. Mix a tablespoon of Amla powder in water to form a smooth paste. To this, add two tablespoons of avocado pulp. Mix well and apply it to your face. Mix two tablespoons of yogurt with one tablespoon of honey and one tablespoon of Amla paste. Apply to your face. Rinse after 20 minutes. Boil and strain tea leaves and let the water cool down. Add two tablespoons of tea water and one tablespoon of honey to Amla paste. Apply and wash with warm water after 10 minutes. Amla oil is an effective treatment for lice. Just soak Amla in water and leave it on overnight. Mash them to make a soapy paste. Use this paste to wash your hair. This will help to get rid of the lice. Regularly using Amla oil will help moisturize the scalp and keep dandruff at bay. If applied to the scalp regularly, Amla can help retain your hair’s natural color and prevent it from greying. Amla oil, if regularly applied to the hair, nourishes the scalp and roots and promotes the growth of long and healthy hair. Mix two tablespoons of Amla powder with one tablespoon of yogurt and one tablespoon of honey in water. Apply to the hair strands and roots. Rinse with warm water after 30 minutes. Take two teaspoons of Amla and shikakai powder in a bowl. Add two tablespoons of yogurt to form a paste and apply it to your hair. Wash after 15 minutes with a mild shampoo. Amla is a wonderful all-rounder fruit. Its medical benefits, combined with its versatility, make it a great addition to one’s diet. So, what are you waiting for? Go and buy some of these magical fruits and get super healthy.